Just as an FYI, OPPO had a UK training event today... sounds like someone may have reported some incorrect information post-event. So, if you're hearing/reading information that clashes with what's been revealed here (so far), ignore it. I've been in contact with the director of product development and he wants to be sure that everyone understands that OPPO is not going to over promise on features that may not be ready for release. Again, the rumor mill is hot and heavy on this particular product... if you have any questions, please post them here and I'll try my best to get a straight answer! bkeeler10 and Robert Zohn like this. Todd Anderson and Robert Zohn like this. 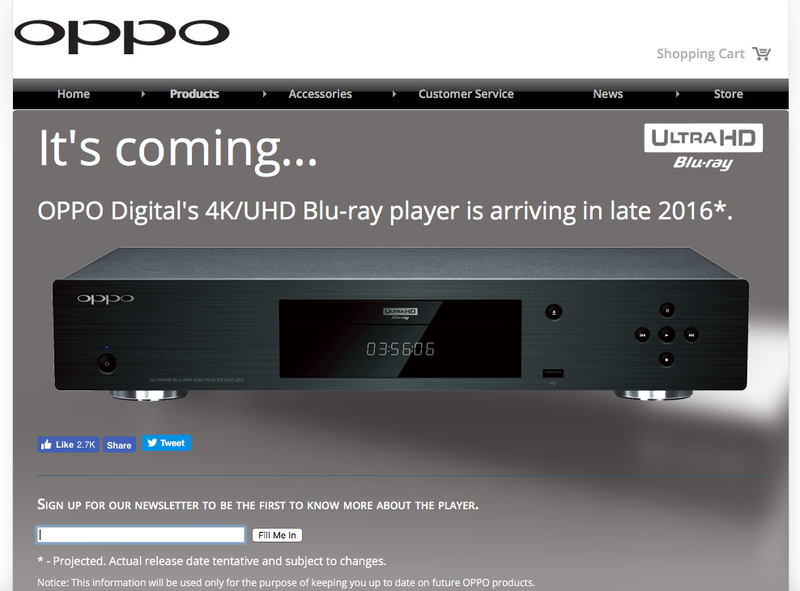 Direct from OPPO's Direct of Product Development: No support for Dolby Vision at this time. Read into that what you will... one would have to assume they are working on it. The new OPPO players will be using a MediaTek decoder chip, and MediaTek is a Dolby Vision partner... so hopefully that's going to be a score for all of us! If (or when) that happens is completely up in the air at this point. In other news... it's great that OPPO is official in the fray, so to speak. Glad to have the competition, especially since it's evident that there is differences in quality across the options already on the market. Tonto, Robert Zohn and skass1 like this. Here's John Archer's Wall Street Journal write-up with some things confirming and new information on OPPO's UDP-203. Thanks for the link, Robert! These players are looking like world beaters! Yes, but I do not expect to be posting any information as I'll be signing a non-disclosure (NDA) and it's a Beta unit so my job is to test everything and report to OPPO engineering. I'm 100% confident it will handle HDR as well as the best UHD BD player and regarding 10-bit I do not believe any UHD BD player puts out 10-bit. Tonto and Robert Zohn like this. Picked up mine 2 days ago. I LOVE THE STRIP METADATA FUNCTION! What it does is give you the rec2020 colour but not the unrealistic nits in brightness range of HDR. Hard to explain but its great! Hey, I resent that. "Men between the ages of 25 to 45 may feel 'movement' when unboxing the Oppo". I am a hell of a lot older than 45 and when I unbox, I know I am going to feel "movement". Maybe Oppo transcends the norm.